Flight cancellations caused by August's terror alert cost British Airways (BA) £40m ($75.9m), the airline has said. BA said it had to cancel 1,280 flights between 10 and 17 August. The £40m bill also includes higher costs of hotels, catering and recovering baggage. Security measures, introduced after police disrupted an alleged plot to blow up planes, led to cancellations and lengthy delays for air travellers. BA said since the disruption there had been "some impact" on forward bookings. However, overall passenger numbers were still up in August compared with last year, rising 1.5% to 3.15 million. The £40m cost is equivalent to about a fifth of BA's pre-tax profits for the April to June period of £195m. 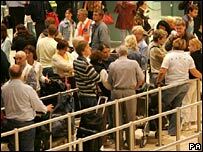 The alert led to significantly tighter security measures at airports with travellers restricted to one clear plastic bag as carry on luggage - holding little more than their passport and tickets. No food or drink was allowed on board and mothers were forced to taste bottles of baby milk to show it was safe. Since the alert, rules have relaxed slightly, with passengers allowed to take one item of hand luggage on board, no bigger than a case for a laptop computer. Airlines have claimed the measures have dented sales and passenger numbers, while no-frills group Ryanair has launched legal action to sue the government for £3.3m for losses it says it incurred because of tighter aviation security. Meanwhile, BA said passenger load factor - which measures how well-filled its planes are - fell to 77.8% from 77.9% in August last year. Looking ahead, the airline added that while underlying market conditions remain good, "visibility" was limited as it emerged from the issues surrounding August's alert.